The idea of visual weight is fairly intuitive. Some things look “heavier” than others in a layout. They draw your attention more easily. And that idea is valuable as a UX designer. Our job is to help users notice the things that matter. And it is equally important not to distract the users from their goals. By adding visual “weight” to certain parts of your design, you increase the chance that a user will see them and you change where their eyes will go next. Remember: visual weight is relative. All visual principles are about comparing a design element to whatever is around it. The difference between light things and dark things is called contrast. The more different a light thing is compared to a dark thing, the “higher” the contrast. 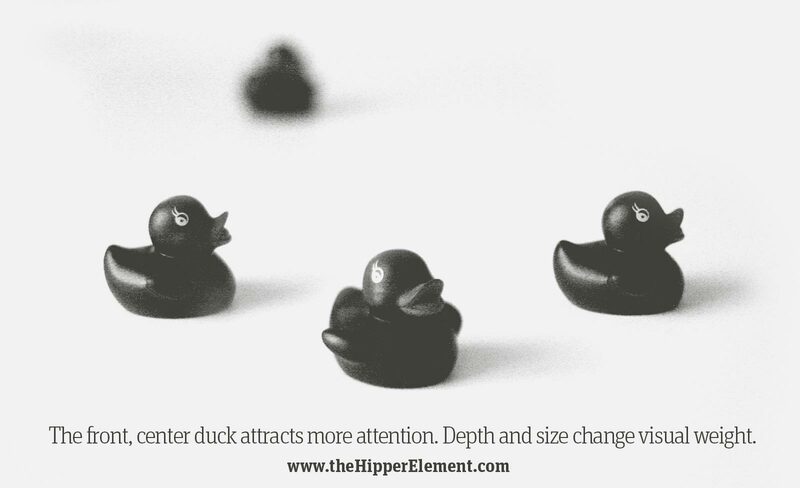 In UX, you want to give important things higher contrast, like the duck in the center. In this case most of the image is light, so a dark duck is more noticeable. If the image was mostly dark, the lighter duck would be more noticeable. If these were buttons, more people would click the dark one than if all the buttons were the same colour. If these ducks were all the same size, you would probably look at them left-to-right (assuming you read that way). If you use blur effects or shadows it just makes the perception of depth more realistic. Size has this effect even if your design looks “flat”. As a general rule, you want more important things to be bigger than less important things. This creates a visual “hierarchy” on the page and makes it easier to scan, but it also allows you to choose what the user notices first. That’s why it’s wrong to “make the logo bigger”. Unless you want users to stare at your logo instead of buying something. Tomorrow we will learn the second of our five visual principles: Colour!